The Scalefour Society’s main contact with its members is through Scalefour News, this website and the Scalefour Forum. Scalefour News is a quality, professionally printed, magazine which is published five times a year, and provides articles and news on finescale modelling, new developments and products, Society activities, practical advice, and honest reviews. Further technical information is published through in the Scalefour Handbook which covers a wide range of topics from basic track building to more advanced techniques. Copies can be downloaded by members as required from the members’ section of this website. The Society also supports a large network of Area Groups, both in the UK and abroad, through which members can keep in touch with one another and, in many cases, work together on joint layouts and other projects. In addition to the Area Groups there is also a Narrow Gauge Study Group dedicated to developing and using finescale standards for narrow gauges. The Society’s main annual showcase is Scaleforum, one of the UK’s top finescale exhibitions. Scaleforum is traditionally held in late September, usually at a venue near to and readily accessible from London. It offers an opportunity to view a superb set of working layouts built to Protofour standards, to see new techniques and products, to see demonstrations by experts, to meet friends and fellow modellers, and to purchase items from the Scalefour Stores. Scalefour North is a similar event that is held in the West Yorkshire area usually around the end of March. 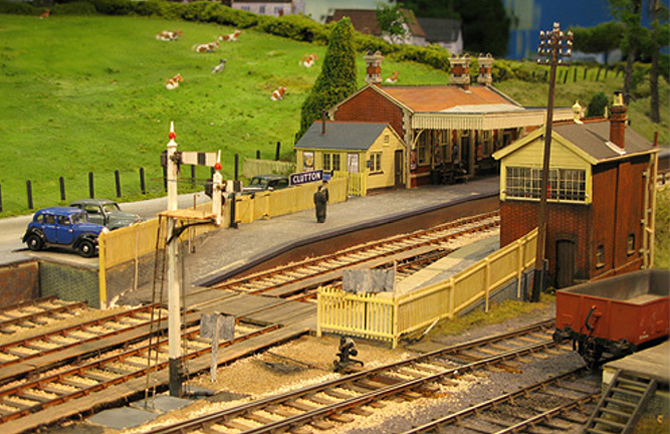 Scalefour South West is held in August, as part of the RailWells finescale show at Wells in Somerset. In addition, the Scalefour Society is represented at many other shows up and down the country throughout the year, and P4 layouts can be seen at most of the finescale exhibitions. For more details of these Shows see the Society’s Shows Page, or the S4 calendar, where detailed information is provided in the months prior to these events. To ensure that essential supplies are available to its members, the Society operates a trading arm called Scalefour Stores that provides an efficient mail order service for track making components, wheels, and many other useful fittings and accessories. A summary of the Stores can be found at the Scalefour Stores Page and a full stores listing and order form is available in the members’ section of this site for members to place orders. News of changes to the range of products are advised in Scalefour News and also on the web site. In the early days of P4 the Scalefour Stores was the only source for many of these items, although we are pleased that the model railway trade now makes ample provision for P4 modelling. Links to many suppliers can be found on our ‘hosted traders’ and ‘links’ pages. It has to be accepted that P4 is not an out-of-the-box concept. Kit-building is probably the commonest approach, although most proprietary locomotives and rolling stock can be converted to P4, some more easily than others. In particular, the conversion of ready-to-run diesels is made easy by commercially available ‘drop-in’ wheelsets. Plain track can be bought, but pointwork falls into the d-i-y category, although kits are available for the more common items of pointwork and parts for several established track construction systems are available from both trade suppliers and the Society’s own Stores. Our links page will get you to the websites of the many suppliers providing kits and components suitable for P4 standards. Protofour, P4, S4, Scalefour, finescale? In simple terms Protofour, abbreviated to P4, is the published standard for track and wheels supported by the Scalefour Society. In a modelling context, S4 is used to refer to the use of tighter construction tolerances than the P4 standard by a few members of the Scalefour Society. Of course, S4 is also used as an abbreviation for Scalefour when discussing the matters of the eponymous Society, its members, and their modelling. As the name suggests, finescale describes an attitude to modelling, the aim of which is that models should be as accurate and realistic as possible. Many of the techniques the Society has developed, and the components it sells, work well with all 4mm standards, including 00 and EM. However, we believe that finescale standards begin with wheels and track, and for that reason the Scalefour Society promotes the P4 standards that produce trackwork to an accurate standard gauge of 18.83mm, and use correctly-profiled wheels.